“The Central Bank of Ireland’s analysis of systemic vulnerabilities is sophisticated and timely. The Central Bank of Ireland has the power to request data directly from regulated entities, and also has powers to require information from unregulated entities under the Central Bank Acts. The Central Bank of Ireland also has powers to change the levels and regulatory perimeter of macroprudential instruments under national law, such as the LTV and LTI limits. There is a dedicated division (Financial Stability Division) that leads systemic risk analysis and macroprudential policy discussions. The biannual Macro-Financial Review (MFR) covers well the stability of individual sectors and property markets. There is, however, still room for further improvement, in particular as to filling data gaps. First, information on domestic and cross-border bilateral liability positions of banks and non-bank financial institutions is still incomplete in places. Second, detailed information on important elements of commercial real estate market activities is lacking. Third, balance sheet data for non-financial corporations is not fully available. Fourth, the absence of a comprehensive credit register precludes the Central Bank of Ireland from connecting credit information of borrowers across financial institutions in Ireland. Moreover, the Macro-Financial Review can usefully cover financial interconnectedness among sectors, as well as within each sector”, according to an IMF report on Ireland. “The Central Bank of Ireland’s analysis of systemic vulnerabilities is sophisticated and timely. The Central Bank of Ireland has the power to request data directly from regulated entities, and also has powers to require information from unregulated entities under the Central Bank Acts. The Central Bank of Ireland also has powers to change the levels and regulatory perimeter of macroprudential instruments under national law, such as the LTV and LTI limits. There is a dedicated division (Financial Stability Division) that leads systemic risk analysis and macroprudential policy discussions. 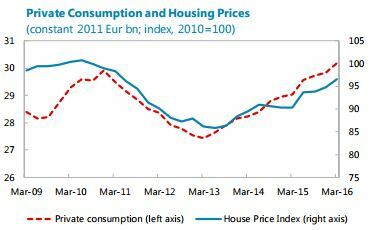 “On the real estate side, Portugal has 5.9 million housing units with an estimated value of €300 billion. 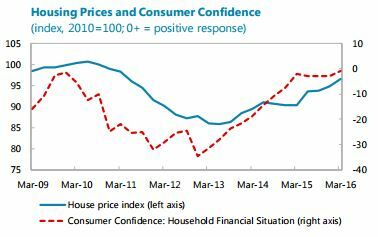 House prices rose 9.9 percent between 2013Q1 and 2015Q4. 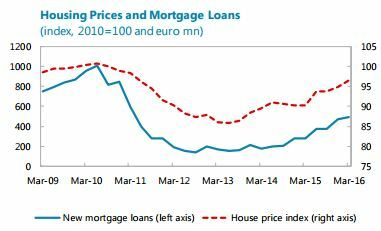 Accordingly, the estimated value of the real estate assets owned by households increased by €25 billion, while household savings declined by €5 billion”, notes IMF report on Portugal. In this issue of the Global Housing Watch newsletter, Shlomo Angel and Achilles Kallergis spoke with Hites Ahir about their work on global housing affordability. Shlomo Angel is a Professor of City Planning and Director of Urban Expansion at the Marron Institute at NYU. Achilles Kallergis is a Research Scholar in the NYU Urban Expansion program. Hites Ahir: The Land and Housing Survey in the UN Sample of Cities was recently completed. One of the aims of the survey is to provide a comparative analysis regarding housing affordability in a global sample of 200 cities. What is the main finding from this survey? Shlomo Angel and Achilles Kallergis: Based on preliminary results from an analysis of 170 cities from the 200-city sample, the survey’s main finding is that cities across regions do face serious affordability challenges when it comes to housing. The median house-price-to-income ratio was 4.8 and the median rent-to-income ratio was 30 percent, values that are above what is generally considered affordable (house-price-to-annual household income ratio of 3.0, and rent-to-monthly household income ratio of 25 percent or less). Hites Ahir: To study housing affordability, you divide the housing sector between informal and formal housing. You then divide formal housing between public and private housing. And finally, private housing between multi-family and single-family housing. What are the shares for each type of housing at the global level? Shlomo Angel and Achilles Kallergis: One of the most challenging tasks for our city-based surveyors was to identify different segments of housing and their respective shares in the overall housing sector. Certainly, the housing sector in each city is much more granular, yet, for the sake of comparability, we decided to adopt these broad categories. In terms of the global estimated shares, the survey results indicate that in the formal private sector, approximately 38 percent of housing is in multi-family buildings and approximately 34 percent in single-family housing. Public and informal housing in our global sample represent approximately equal shares of 14 percent. Hites Ahir: How do these shares affect housing affordability? Shlomo Angel and Achilles Kallergis: The different shares and segments of the overall housing sector play an important role in determining affordability. In many ways, the presence of an informal housing sector and public housing sector, which are the most affordable sectors across our city sample, acts as a cushion for low-income residents who cannot afford a dwelling in the formal private sector. If we omit the informal housing and public housing sectors, housing affordability is further exacerbated, particularly in cities that informal housing and public housing represent a significant share of the housing stock. To give an idea, excluding informal and public housing, the global median house-price-to-income ratio increases from 4.8 to 6.1, and the median rent-to-income ratio increases from 30 percent to 35 percent. Now, there seems to be an interesting interplay between the formal and informal housing market, which based on survey data it would be worth exploring further. For instance, Brueckner and Selod offer an interesting theory based on the idea that informal and formal residents compete for land within a city and that the informal market “squeezes” the formal market, and therefore affects affordability in the formal sector. From a policy perspective, this type of interplay is important, as it implies that formalizing squatter settlements could have beneficial effects for both informal and formal residents. Hites Ahir: What does the survey results tell us about developing countries? Shlomo Angel and Achilles Kallergis: One of the major messages of the survey is that affordability challenges are currently present in the growing cities of developing countries. A median house-price-to-income ratio of 4.8 is found in both developing and developed countries. Informal housing, which occupies approximately 18% of the housing sector in developing countries, is the most and in many cases the only affordable sector of the housing market. What is further worrying is that new formal private sector construction is often too expensive for median households, with the median house-price-to-income ratio for formal private multi-family buildings being 5.3. For instance, in Kilamba, Angola, a satellite city in the outskirts of Luanda, a typical housing unit costs 17 times the median household income. The current unaffordability in developing countries has serious implications once we consider that between 2015 and 2050, 95% or 2.25 billion of the world’s urban population increase is expected to take place in developing countries. Unless, the housing question is addressed, unaffordability in developing countries will further exacerbate in the future. 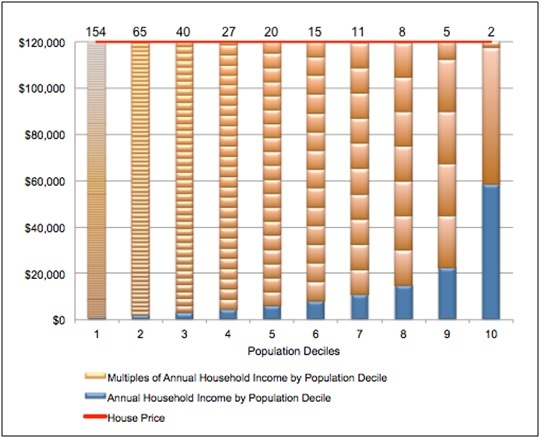 Figure 2: The numbers on top of each bar represent annual incomes required for the purchase of an US$120,000 3-bedroom apartment in Kilamba, Angola, for each population decile (from low-income to high income). Hites Ahir: And what about developed countries? Shlomo Angel and Achilles Kallergis: Knowledge on housing affordability in developed countries is far more advanced and in many ways the survey results confirm previous studies on housing affordability. However, differences are present given that our definition of cities based on built-up space do not always coincide with administrative boundaries of urban areas. Median house-price-to-income ratio for developed countries is 4.8. In terms of shares of the housing sector, the bulk of housing units (90 percent) is in formal private housing; about one-tenth is in the more affordable public housing while informal housing represents only 1 percent. It is worth noting the importance of these shares as both private multi-family and private single-family housing are the least affordable segments of the housing market. Hites Ahir: How does the housing affordability picture look like by geographic region? Shlomo Angel and Achilles Kallergis: As expected, there is variation in terms of housing affordability by region with the most affordable regions being Southeast Asia, sub-Saharan Africa and land rich countries (United States, Canada, Australia) and the least affordable being Western Asia and North Africa, South and Central Asia, East Asia and the Pacific, and Latin America and the Caribbean. An interesting metric developed for the purposes of the survey, is to look at housing affordability of the formal private sector –what we call Median Affordability or simply, the ability of the median household in a given city to acquire or rent a housing unit in the formal private housing sector. Based on this metric, in all geographic regions the house price-to-income ratio is higher than the house price-to-income by Occupant Affordability, an affordability metric which includes the informal and public housing sectors. The differences are exacerbated in the regions where the informal sector and public housing sector constitute higher shares of the housing stock. In Sub-Saharan Africa, for example, the house price-to-income ratio measured by Median Affordability more than doubles. Hites Ahir: Could you provide two examples, where housing is affordable in one city and it is not affordable in another city? What could explain this divergence? 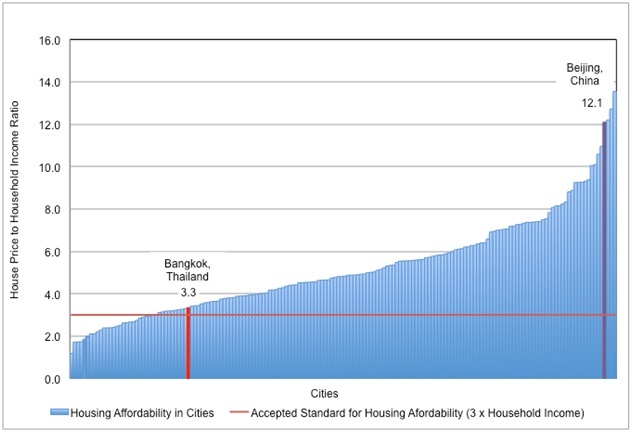 Shlomo Angel and Achilles Kallergis: In the Bangkok metropolitan area, housing is largely affordable with households contributing 3.3 yearly incomes to acquire a housing unit. In Beijing, China, housing is generally unaffordable with the occupant households contributing 12.1 yearly incomes to acquire a housing unit. While these differences are significant it is difficult to explain this divergence by simply relying on the survey data. In other words, affordability is a complex, idiosyncratic matter explained through a variety of reasons most often pertaining to city population growth, land use management and land use and housing regulations. One of our future tasks is to see how other metrics of the Monitoring Global Urban Expansion program such as the growth of the urban extent, the quality of urban layouts, and the land use and regulations regime in the 200-city sample relate to the affordability of housing. For instance, an interesting question arises as to the specific effects of land containment, through regulations such as the imposition of urban growth boundaries, greenbelts etc. to housing prices. Hites Ahir: What are the key messages for policymakers? Shlomo Angel and Achilles Kallergis: The central message from the preliminary survey results indicates a global housing affordability crisis that the formal private housing market alone is failing to confront. This affordability crisis cannot be addressed unless it considers all segments of the housing stock—including public housing and informal housing that are now the only housing solutions affordable to large segments of the urban population—while creating conditions for the private housing sector to reach further down-market. But beyond the changes in housing policies, and given the challenges ahead, there is a need to consider housing policy within a broader urban perspective. Housing is a key aspect of the urbanization process as it determines the spatial arrangements that regulate the cities productive structures and their ability to generate inclusive growth. For housing to be adequate, ample, affordable, and accessible to urban labor markets, land on the urban periphery must remain in plentiful supply and well connected by arterial roads; land and housing regulations must be made more realistic and responsive; property rights in housing must be better organized; and housing finance services must expand their reach. Hites Ahir: What’s next for your research? Shlomo Angel and Achilles Kallergis: The results from the survey represent a baseline for further monitoring housing affordability. We expect to continue this monitoring exercise in order to get better insights on housing conditions across the world. Further on, using the 200-city sample as a research vehicle, a sample that is representative of the universe of cities (all areas that in 2010 had a population of 100,000 or more) we hope to further explore critical aspects of the development of cities by adding layers of data. In this context, we are currently considering a survey on transportation that maps both formal and informal transportation networks. Finally, we are planning for a study of water quality across our 200 cities, through the collection and analysis of water samples from several areas in each one of the cities. Today, Richard Koss (IMF) made a presentation on the developments in global real estate at the 58th NABE Annual Meeting in Atlanta. To see his presentation click here. Other speakers at the conference included: Robert Shiller (Yale University), Jed Kolko (Indeed), Issi Romem (BuildZoom), Marisa DiNatale (Moody’s Analytics), Jessica Lautz (National Association of Realtors), and Selma Hepp, (Pacific Union).